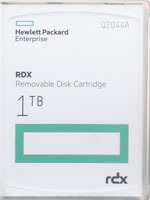 HPE RDX: The Smartest Backup For Your Business. 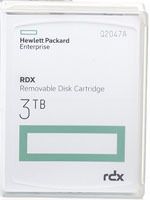 Hewlett Packard Enterprise RDX delivers portable, safe, ultra-fast backup for your workplace data. 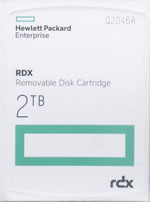 Here are ten reasons to choose HPE RDX. It's Mobile - You can take your data with you, whether working away from the office or storing critical files off-site. The portable, rugged design of RDX’s cartridge style hard drive provides a simple, robust and low-cost disaster recovery solution. Works off grid - Plug the dock into any device with a USB 3.0 connection and you can access your data wherever you go, giving you plenty of time to work in the field without relying on direct power. Keeps your data on- and off-site at the same time - Back up to the cloud, and keep a local, realtime copy of critical data. With RDX, your data is never far away and can always be accessed, without relying on the hidden costs, significant time and unpredictable connectivity of a cloud restore. Completely hands off and hassle-free - Switch RDX to work in fixed disk mode and take full advantage of the automated backup application native to Windows OS. Everything’s managed by the system, so you and your team don’t have to remember to do the backups. Just right for your small business - RDX works across all industry standard operating systems and virtualization platforms. It easily adapts to any small business, remote site and branch office. No upgrades required. There’s always room for your data - As soon as one cartridge is full, just back up to another. Cartridge capacities range from 500 GB to 4 TB, giving more than enough compact storage scope for dynamic business environments. Super-fast - With hard drive data transfer speeds and built-in anti-vibration buffers, RDX gets the job done at top read/write speeds. You can back up and restore critical files in seconds and much faster than you can from the cloud. Your data’s always protected - Embedded SATA connectors make the host resilient to interference from statically charged peripherals. And a sealed interface means no wear, alignment issues or debris build-up. Keeps data out of the firing line - Businesses are increasingly at risk of cyberattacks, and particularly vulnerable to ransomware invasion. With RDX, you can always roll back to a secure offline copy of your data. It fits right in, anywhere you want - u can connect an RDX cartridge to a laptop or micro server, slot it into a tower server or mount it in a rack. RDX can work across a network of small branches, temporary sites or a single business premises, and provide all the backup you’ll ever need. Shocking statistics! HPE RDX is tough! We tied an HPE RDX cartridge, packed with data, to the back of a dragster and ran it up the Santa Pod raceway at 170 mph for over a quarter of a mile. It came as no surprise to us that we were able to recover all its data intact at the end of the run. 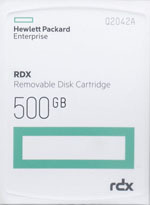 But then, with a blistering 650 GB/hour transfer rate, HPE RDX is no stranger to high speeds.